Remanufacturing of a second-hand gearbox. Testing of a remanufactured gearbox. The damaged parts (scraps) from vehicles currently in use are being collected through the commercial reverse logistic network. 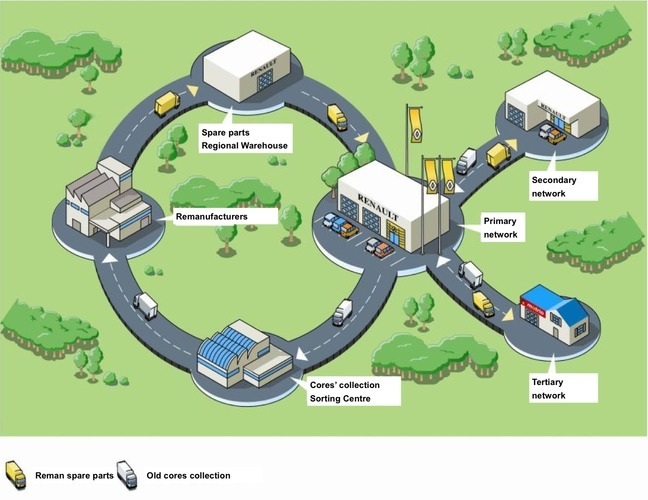 Renault’s plant in Choisy-Le-Roi deploys its activities in the area of the remanufacturing of used spare parts. Each year, it remanufactures around 15,000 engines, 20,000 gear boxes and 18,000 injection systems. After having been collected in Renault’s sales network, spare parts are dismantled in order to check the conformity of all their components. These components are used to reassemble spare parts, which are sold at a later stage as genuine & guaranteed replacement parts in Renault sales network. Spare parts components that are not deemed conformed are sent to foundries to be recycled. Increase by 10% of the reuse ratio of spare parts. In some countries, the import of used spare parts is forbidden. This is a significant barrier as it restrains new market opportunities. A suitable solution to this issue would be to create a European status for remanufacturing in order to differentiate remanufactured spare parts from wastes. In order to enhance the competitiveness of the recycling operators, pull mechanisms such as a reduced VAT for re-used spare parts would be useful tools.